The Grenadier Guards (GREN GDS) is an infantry regiment of the British Army. It can trace its lineage back to 1656 when Lord Wentworth's Regiment was raised in Bruges to protect the exiled Charles II. In 1665, this regiment was combined with John Russell's Regiment of Guards to form the current regiment, known as the 1st Regiment of Foot Guards. Since then, the regiment has filled both a ceremonial and protective role as well as an operational one. In 1900, the regiment provided a cadre of personnel to form the Irish Guards; while later, in 1915 it also provided the basis of the Welsh Guards upon their formation. "Evil be to him who evil thinks"
The regiment's early history saw it take part in numerous conflicts including the War of Spanish Succession, the War of Austrian Succession, the Seven Years' War, and the Napoleonic Wars; at the end of this period the regiment was granted the "Grenadier" designation by a Royal Proclamation. During the Victorian Era, the regiment took part in the Crimean War, the Anglo-Egyptian War, the Mahdist War, and the Second Boer War. During the First World War, the Grenadier Guards was expanded from three battalions to five, of which four served on the Western Front, while later during the Second World War, six battalions were raised, and several were converted to an armoured role as part of the Guards Armoured Division. These units fought in France, North-West Europe, North Africa and Italy. In the post Second World War period the regiment was reduced firstly to three battalions, then later two and finally one battalion in the mid-1990s. Major deployments during this time have included operations in Palestine, Malaya, Cyprus, Northern Ireland, the Gulf War, Afghanistan and Iraq. The Grenadier Guards trace their lineage back to 1656, when Lord Wentworth's Regiment was raised in Bruges, in the Spanish Netherlands (present-day Belgium), from gentlemen of the Honourable Artillery Company by the then heir to the throne, Prince Charles (later King Charles II) where it formed a part of exiled King's bodyguard. A few years later, a similar regiment known as John Russell's Regiment of Guards was formed. In 1665, these two regiments were combined to form the 1st Regiment of Foot Guards, consisting of 24 companies of men. Since then the Grenadier Guards have served ten Kings and four Queens, including the current Queen Elizabeth II. Throughout the 18th century, the regiment took part in a number of campaigns including the War of Spanish Succession, the War of Austrian Succession and the Seven Years' War. At the end of the Napoleonic Wars, the regiment gained the name "Grenadier" in July 1815 following a Royal Proclamation. Attack on Moyenneville. Men of the Grenadier Guards consolidating the former German second line. Near Courcelles, France, 21 August 1918. At the outbreak of the First World War in August 1914, the regiment consisted of three battalions. With the commencement of hostilities, the regiment raised a service battalion, the 4th Battalion, and a reserve battalion, known as the 5th (Reserve) Battalion, which was used to carry out ceremonial duties in London and Windsor during the war. The 2nd Battalion of the regiment was sent to France in August, and the 1st Battalion followed to Belgium in October. They took part in the early stages of the fighting during the period known as "Race to the Sea", during which time they were involved significantly at the First Battle of Ypres. 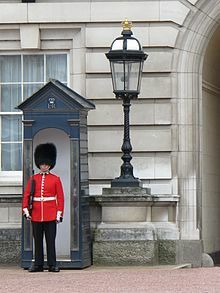 In February 1915, a fifth Guards regiment was raised, known as The Welsh Guards. In recognition of the significant contribution Welshmen had made to The Grenadier Guards, the regiment transferred five officers and 634 other ranks to the newly formed unit. A short time later, permission was received for the formation of the Guards Division, the brainchild of Lord Kitchener, and on 18 August 1915, the division came into existence, consisting of three brigades, each with four battalions. Following this the four service battalions of the regiment fought in a number of significant battles including Loos, the Somme, Cambrai, Arras and the Hindenburg Line. Seven members of the regiment received the Victoria Cross during the war. Following the Armistice with Germany in November 1918, the regiment returned to just three battalions, which were used in a variety of roles, serving at home in the United Kingdom, as well as in France, Turkey and Egypt. During the Second World War, the regiment was expanded to six service battalions, with the re-raising of the 4th Battalion, and the establishment of the 5th and 6th Battalions. The Grenadier Guards' first involvement in the war came in the early stages of the fighting when all three regular battalions were sent to France in late 1939 as part of the British Expeditionary Force (BEF). The 1st and 2nd Battalions were serving in the 7th Guards Brigade, which also included the 1st Battalion, Coldstream Guards, and were part of the 3rd Infantry Division, led by Major General Bernard Montgomery. The 3rd Battalion was in the 1st Guards Brigade attached to the 1st Infantry Division, commanded by Major General Harold Alexander. As the BEF was pushed back by the German blitzkrieg during the battles of France and Dunkirk, these battalions played a considerable role in maintaining the British Army's reputation during the withdrawal phase of the campaign before being themselves evacuated from Dunkirk. After this, they returned to the United Kingdom, where they undertook defensive duties in anticipation of a possible German invasion. Between October 1940 and October 1941, the regiment raised the 4th, 5th, and 6th Battalions. Later, in the summer of 1941, there was a need to increase the number of armoured and motorised units in the British Army and as a result many infantry battalions were converted into armoured regiments; the 2nd and 4th Battalions were re-equipped with tanks, while the 1st Battalion was motorised. The 1st and 2nd (Armoured) Battalions were part of the 5th Guards Armoured Brigade, attached to the Guards Armoured Division, and the 4th Battalion was part of the 6th Guards Tank Brigade Group. 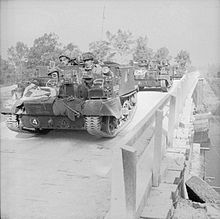 They subsequently served in the North West Europe Campaign of 1944–45, taking part in several actions, including the Battle for Caen, particularly in Operation Goodwood, as well as Operation Market Garden, the Battle of the Bulge and Operation Veritable. Universal Carriers of the 1st Battalion, Grenadier Guards cross 'Euston Bridge' as they deploy for Operation 'Goodwood', 18 July 1944. The 3rd, 5th and 6th Battalions served in the North African Campaign and in the final stages of the Tunisia Campaign, under command of the British First Army, where they fought significant battles in the Medjez-el-Bab and along the Mareth Line. The battalions took part in the Italian Campaign at Salerno, Monte Camino, Anzio, Monte Cassino, and along the Gothic Line. The 3rd Battalion, still with the 1st Guards Brigade, was attached to the 78th Battleaxe Infantry Division for two months in Tunisia until it was exchanged for the 38th (Irish) Brigade and became part of the 6th Armoured Division, where it would remain for the rest of the war. The 5th Battalion was part of 24th Guards Brigade and served with the 1st Division during the Battle of Anzio. After suffering devastating casualties, the brigade was relieved in March 1944 . The 6th Battalion served with the 22nd Guards Brigade, later redesignated 201st Guards Motor Brigade, until late 1944 when the battalion was disbanded due to an acute shortage of Guards replacements. Throughout the course of the conflict, two men of the regiment were awarded the Victoria Cross. They were Lance Corporal Harry Nicholls of the 3rd Battalion, during the Battle of Dunkirk, and Major William Sidney of the 5th Battalion during the Battle of Anzio in March 1944. In June 1945, following the end of hostilities, the 2nd and 4th Battalions gave up their tanks and returned to the infantry role. The regiment returned to three battalions at this time, with the 4th and 5th Battalions being disbanded along with the 6th, which had been removed from the order of battle before the end of the war. Initially, they were employed on occupation duties in Germany; however, the 3rd Battalion was deployed shortly afterwards to Palestine, where it attempted to keep the peace until May 1948, when it was replaced by the 1st Battalion. Further deployments came to Malaya in 1949, Tripoli in 1951 and Cyprus in 1956. In 1960, shortly after returning from Cyprus, the 3rd Battalion paraded for the last time and was subsequently placed in suspended animation. In order to maintain the battalion's customs and traditions, one of its companies, the Inkerman Company, was incorporated into the 1st Battalion. Since the mid-1960s, the 1st and 2nd Battalions deployed to Africa, South America and Northern Ireland where they undertook peacekeeping duties. They also undertook duties as part of the NATO force stationed in Germany during the Cold War. In 1991, the 1st Battalion, which had been serving in Germany at the time, was deployed to the Middle East, where it took part in the Persian Gulf War mounted in Warrior armoured personnel carriers, before returning for a six-month tour of Northern Ireland. In 1994, under the Options for Change reforms, The Grenadier Guards was reduced to a single battalion. The 2nd Battalion was put into 'suspended animation', and its colours passed for safekeeping to a newly formed independent company, which was named "The Nijmegen Company". As a result of this, the regiment was reduced to its current composition: one full battalion, the 1st Battalion, consisting of three rifle companies (The Queen's Company, Number Two Company and Inkerman Company), a support company and a headquarters company, based at Wellington Barracks, London, and one independent company, The Nijmegen Company. The Queen, as Colonel-in-Chief, presented new colours to the Nijmegen Company in 2013. The Colonel-in-chief (Elizabeth II) alongside the then-Colonel of the Regiment (Prince Philip) in 2007. In recent years, the 1st Battalion has deployed as part of Operation Telic in Iraq, and Operation Herrick in Afghanistan. The Queen's Company of The Grenadier Guards traditionally provides the pallbearers for all deceased monarchs. The Grenadier Guards and other Guards regiments have a long-standing connection to The Parachute Regiment. Guardsmen who have completed P Company are transferred into the Guards Parachute Platoon, which is currently attached to the 3rd Battalion, The Parachute Regiment. The Guards Parachute Platoon maintains the tradition established by No 1 (Guards) Independent Parachute Company that was part of the original Pathfinder Group of 16th Parachute Brigade, which has since been designated as the 16th Air Assault Brigade. Under Army 2020 Refine, the 1st Battalion was moved from Aldershot to Windsor and moved into London District. Recruits to the Guards Division go through a thirty-week gruelling training programme at the Infantry Training Centre (ITC). The training is two weeks more than the training for the Regular line infantry regiments of the British Army; the extra training, carried out throughout the course, is devoted to drill and ceremonies. Both the 2nd Grenadier Guards F.C. and the 3rd Grenadier Guards F.C. enjoyed considerable success in the London League. ^ Colonel of Lord Wentworth's Regiment. ^ Colonel of John Russell's Regiment of Guards until united with Wentworth's Regiment in 1665. ^ "Britain and Belgium mark 360th anniversary of the Grenadier Guards". Ministry of Defence (United Kingdom). 2 September 2016. Retrieved 4 September 2016. ^ "Branch notes (Northamptonshire)" (PDF). The Grenadier Gazette. 2014. p. 108. Retrieved 9 September 2016. ^ Palmer, Rob. "1st Infantry Division" (PDF). British Military History. Retrieved 9 August 2015. ^ a b "History of the Grenadier Guards" (PDF). British Army. Archived from the original (PDF) on 25 September 2012. Retrieved 18 July 2010. ^ a b c d "Grenadier Guards". British Army. Archived from the original on 22 July 2010. Retrieved 18 July 2010. ^ "Grenadier Guards honoured by the Queen at Buckingham Palace". ^ "No 1 (Guards) Independent Parachute Company". ParaData. Retrieved 10 January 2013. ^ a b "Grenadier Guards". National Army Museum. Archived from the original on 3 November 2014. Retrieved 9 November 2014. ^ "The Duke of York will take over the appointment from HRH The Duke of Edinburgh, who has been Colonel of the Grenadier Guards since 1975". Royal Family. Retrieved 18 February 2018. ^ "2nd Grenadier Guards". Football Club History Database. Retrieved 13 November 2011. ^ "3rd Grenadier Guards". Football Club History Database. Retrieved 13 November 2011. ^ Defence Instructions and Notices (DIN) 2007DIN09-027, The Precedence of Regiments and Corps in the Army and within the Infantry, August 2007. Hanning, Henry (2006). The British Grenadiers: Three Hundred & Fifty Years of the First Regiment of Foot Guards 1656–2006. London: Pen and Sword Books. ISBN 1-84415-385-1. Nicolson, Nigel (1949). The Grenadier Guards in the War of 1939–1945, Volume II: The Mediterranean Campaigns. Aldershot: Gale & Polden. OCLC 4992796. British Army site about the GG.